I thought I'd share my favorite trick i've ever taught a dog. So far i've done it successfully with 4 puppies. The first took about a week, the most recent took about 2 days to housetrain the puppy. First - It helps to be prepared to do this BEFORE you bring your new puppy home. It's a lot easier to create a new habit than it is to break an old one, so if you teach your puppy that this is how it works from the beginning, it'll go much more smoothly/quickly. about 3 - 3.5 feet of some sort of string/twine/yarn/ribbon..
1 jingle bell. (i get 6 packs at the dollar store during the holidays, but you could probably use jingly cat toys too.. just make sure you get the loudest thing you can. 1- Tie the jingle bell to one end of the string. Don't let the string stifle the jingly part though.. you need it to make noise! 2- Tie the other end of the string around the doorknob so that the bell falls a few inches above the floor. 3- Bring puppy home! Yaay! 4- when puppy is waking up from a nap, immediately pick him up and carry him to the door. 5- hold him at eye level so he can watch as you grab the bell and ring it. 6- as SOON as you jingle it, with no hesitation, say the word, OUTSIDE and immediately open the door. 7- carry puppy out and set him down to do his business. 8 - here's the hard part: do this EVERY time you go out that door. with my pups, that was about every 2 hours. This teaches the dog that in order to make that door open, you have to ring the bell first. 9 - after a few trips through the door, set them on the floor in front of the bell while you ring it, making sure you have their attention. Proceed with immediately saying "OUTSIDE" and going out. 10- soon you'll be able to point to the bell and they'll jingle it for you, and, as always, immediately say "OUSIDE" and open the door and go outside. Then, he'll quickly learn to do it every time he has to go outside, even if you're not at the door to provide guidance. Voila! your puppy rings the bell when he wants to go outside. Enforcement: The trick here is that EVERY time the pup rings that bell on his own, you need to IMMEDIATELY run to the door, say "outside", and go outside. AND every time you go outside, you need to ring the bell and say the word first... I prefer always in the same order also. As puppy grows, tie the string shorter and shorter so it's always just below eye level. Last edited by silentskream; 11-07-2010, 11:41 AM. I should add - our GSD pups are 2 years old now, and still ring the bell to go outside.. the cool part, however, is that they've extrapolated, and now use their nose to "tap" the doorknob of any room they want to go into. This includes rattling the doorknob when i'm taking a nap and they want me to wake up, when I'm in the shower and they want me to come out of the bathroom, when my husband leaves for work and they want to go with him, etc. so smart! I did this with Cooper when he was a tiny pup and it worked great! I was thinking of doing this with Milly, but she is pretty good at letting me know when she wants out with her loud, obnoxious whiney talk standing by the door. I love your idea of making this....I saw at pet Supplie Plus they had Jingle Bell Hangers made of pretty ribbon with 3 bells each...They were selling them for 19.00!!!! RIP OFF. i'm glad i went the dollar-store route!! I go to yard sales and the bells are plentiful, usually with a Christmas theme. We took Frankie and lifted his paw so it hit the bell and took him out. It was GREAT!!! Now we have a doggie door and they come and go at will. I was so excited about this and told my daddy about it. Mistake!! because he is such a teaser he asked how long it would take Ellie and Bluebelle to learn to say "Outside". Between my girls and my daddy (living back with us now) I stay cracked up alot. I absolutely LOVE this...but we're having an overuse issue haha. Zoey is great at telling me when she wants out, but she also loves the bell when she has no interest in going out! She just runs over because she wants to ring it, then when I take her outside gives me this look like "mom! I was playing with that, why do we have to go outside AGAIN?!" When we were having that problem, I'd put Brembo out by herself and shut the door behind her for a minute or two. She quickly stopped "playing" with the bells. She doesn't like going out alone. I'm glad Puffin didn't ever play with them because she LOVES to sit or wander in the backyard by herself. It worked with Memphis really quickly. The one tip I read about is to not use their paw to ring it - use their nose only. As the Danes get bigger, and their paws grow, you don't want them pawing the bell to go out. Although Memphis does ring the bell with his nose, he uses his paw to pound on the door when he wants to come back in. I've now got scratches on my doorwall and door, and am afraid one of these he's gonna put his paw right through the glass and really hurt himself. Any tips on unteaching this habit would be really appreciated. Kiizhik-LabXRotti (1999-2012) R.I.P. baby girl. 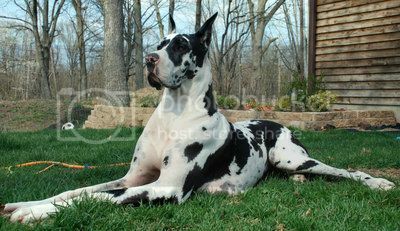 Deaglan-Dane (May 2008-Feb 26, 2016) RIP My Sweet Boy. Yes this works very well I have always had standard poodles and I use little cow bells from a feed store like tractor supply ect. I am using this method now with a 4 month old great dane puppy I rescued, she is picking it up pretty good. Is a great potty training method.